The Marquess of Longcroft, Edmund Townsend, has always preferred complex mathematical equations to the trappings of society. And love? Love is a non-quantifiable concept. Still, Lady Abigail is his sister's friend, and he finds himself drawn into the mystery of her affianced... even as he begins to anticipate Lady Abigail's company with unfathomable pleasure. Investigating the murder may reveal more than the sordid truth. It may just reveal the love Abigail always wanted... a little too late. The usual historical romance heroine these days is quirky, unconventional, somehow a misfit within society. Not always, of course, but often. Say You'll Love Me ignores our expectation on that front by giving us Lady Abigail. You see, Lady Abigail isn't that sort of heroine. She's not willing to blindly follow her father's wishes, but she respects the constraints of society. She understands that not playing by the rules will result in certain consequences, and she decides what she can and cannot live with, within those constraints. While I love a good, eccentric, quirky, and especially smart historical heroine (Amanda Quick's mid-90s work has a special place in my heart), I appreciated that Lady Abigail was more representative of what historical romances would have us believe was the norm. I liked Edmund well enough. He's intellectual, with a low emotional IQ, as it were, and the idea of love confounds him. I liked the way he rationalized his behaviour and continued interest in Abigail. The romance itself was gentle and respectful, which was kind of a novelty, I have to admit. So often couples rush to intimacy or ignore the various strictures of society and so forth. The investigation into the truth about the maid's death provided the main thrust of the story beyond the romance, and I thought it was interesting enough. Not quite thrilling, mind you, and the romance wasn't quite as captivating as it might have been. There were a few moments that fell flat for me, particularly around Lady Abigail's betrothed who was dangerously close to being a caricature at points. Still, overall, Say You'll Love Me was an enjoyable read. It's quick to read, and it doesn't require a big emotional investment either. While it doesn't leave a big impression, there wasn't anything about it that had me throwing my hands up in the air either. Solidly middle-of-the-road, which sometimes is just the thing in the middle of a crazy week. 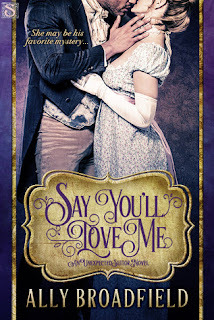 While I won't return to it for a second read, Say You'll Love Me was an entertaining, relatively sedate historical romance--if having a murder investigation as the setting for a romance can be considered sedate? Quick Reviews: Contemporary Romance Trifecta!